For a translation in Spanish by Global Voices' César Pérez, see here. Elmer Campos Álvarez, a 32-year-old farmer, is from the Caserío Tupac Amaru in the province of Celendín, Cajamarca Region, Northern Peru. On November 24, 2011, Elmer, along with some friends, set out for the mountains of Cajamarca to protest against a massive open-pit gold mine proposed for the districts of Sorochuco and Huasmín. Elmer and his friends call themselves los defensores de las lagunas (the Defenders of the Lakes). See Elmer's video testimony published by La Mula in January 2012.) Still defending the lakes, anti-mining protesters such as Elmer face a new threat in a new law that allows police to use deadly force without fear of consequences. Three days later they reached the Maque-Maque crossroads, between the Azul and El Perol lakes, two of the four lakes threatened by the project. Meanwhile, a general regional strike had been declared in opposition to the mine. In the early morning of November 29, a confrontation broke out when some 30 police officers contracted by Minera Yanacocha to guard the concession site ordered the protestors to go away. The police fired tear gas, rubber bullets, and live ammunition. When the police started firing, Elmer went to aid one of his friends and was shot in the back. He lost consciousness and was taken to the city of Chota, and then to the coastal city of Chiclayo, where he was hospitalized for a week. He lost a kidney and his spleen, and suffered a spinal cord injury that paralyzed him from the waist down. An estimated 24 other protestors were injured in the Maque-Maque crackdown. 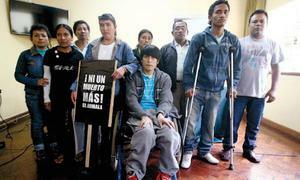 People in Cajamarca know all too well of the impacts of large scale gold mining. For the past two decades, Newmont Mining and Buenaventura have operated the Yanacocha mine, the largest open-pit goldmine in South America. A planned expansion known as the Conga project is said to assure another twenty years of production. The total investment tops $4.8 billion, one of the biggest ever in Peru’s mining sector. A plant with the capacity to process 92,000 tons of rock a day would produce 3.1 billion pounds of copper and 11.6 million ounces of gold (an executive summary of the project's Environmental Impactv Study, or EIA, is accessible here). Compañía de Minas Buenaventura is Peru's largest publicly traded precious metals company and a major holder of mining rights throughout the country. It has two big U.S. partners: Denver-based Newmont Mining at Minera Yanacocha in Cajamarca and Phoenix-based Freeport-McMoRan at Sociedad Minera Cerro Verde in Arequipa. Peru is the world's sixth-largest gold producer. Protesters have challenged the Conga mine for the past several years, and police repression is currently the subject of two legal proceedings in Peru. The first is a criminal investigation against the two commanding police officers the day of the attacks, Coronel Amador Bacalla Guadalupe and Captian Wagner Ocampo Huamán. The second is a civil lawsuit against the police authorities and responsible government officials. The struggle has returned to the United States as well. On January 2, 2014, EarthRights International (ERI), representing Elmer Campos, filed a federal court motion in Newmont's hometown, Denver, Colorado, seeking information held by the company including photographic and video evidence, reports of Yanacocha security or employees, records of communications with the police, and internal company communications, that shed light on the events of that day and for the benefit of the Peruvian legal proceedings. The action was filed under 28 U.S.C. § 1782, a law which allows parties in foreign legal proceedings to obtain documents and information from individuals or companies in the United States. Elmer and ERI’s legal action attracted considerable attention in late January in the Peruvian press and social media. This coincided with a coordinated offensive to present the local leaders opposed to Minera Yanacocha in Cajamarca as "backed by foreigners interested in blocking the economic development of our country," as a researcher associated with the mining sector claimed recently in El Comercio newspaper. The propaganda campaign to delegitimize local leaders also targeted the Piura region, where Buenaventura wants to develop the El Faique gold project. Starting with a strong precedent under former President Alan García, government response to protest in Peru has been overwhelmingly militarized. Steven Levitsky calls it the "Lima consensus:" Lima elites adhere to orthodox neoliberalism, such that the use of lethal force seems to be a legitimate way to deal with social protests in mining areas. Despite the fact that Ollanta Humala’s administration has sometimes sought more political and negotiated means, this consensus remains in place. A report released in December 2013 by Peruvian NGOs Grufides, Derechos Humanos Sin Fronteras (Human Rights without Borders), the Coordinadora Nacional de Derechos Humanos (National Coordinator for Human Rights, CNDDHH), and the Society for Threatened Peoples (STP) of Switzerland, revealed that foreign mining corporations have signed agreements with the National Police to secure their operations. These agreements allow them to request permanent police presence or ask for rapid deployment of larger units to repress social protests. In some cases, the report reveals, the companies provide the police with full financial and logistical support. International human rights organizations like Human Rights Watch and Amnesty International, among others, have asked President Humala to prevent the unlawful use of lethal force by security forces during crowd-control operations. But Peru’s government seems to be going in the exact opposite direction, as an article in the penal code was modified last month in a way that critics say allows police and the military to use deadly force without facing consequences. The new Law 30151 says that members of the Armed Forces and the National Police are “exempt from criminal responsibility” if they cause injury or death through the use of their guns while on duty. In a statement condemning the law, the Public Ombudsman’s office recalled that since mid-2011, 34 civilians have been killed and more than 949 people wounded in social conflicts, including five military and 357 police. A number of national and international human rights organizations, including the Inter-American Commission on Human Rights (IACHR) and the United Nations Office of the High Commissioner for Human Rights (OHCHR) have also condemned Law 30151. 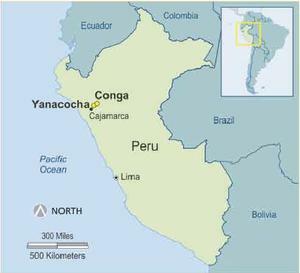 As Yanacocha comes to exhaustion, mining operations need to expand. The Conga project is one of these expansion plans, perhaps the most ambitious. A long history of mining conflicts in Cajamarca suggests that Elmer’s struggle for justice will be a long one, and in all likelihood, one of many. Luis Manuel Claps studied Communications at the Buenos Aires University. He has followed mining in Latin America since 2004 as editor of the Mines and Communities Website. He is based in Lima, Perú.